Stunning high quality moonstone – clear with a deep blue/purple fire. The silver is finely hand-carved on the sides and back of the stone in our signature Ozmomo setting. This pendant is a one-off piece with the carving pattern designed and hand-made especially for this individual stone. Wear high or low on your choice of chain, to fit with your own unique style. This is a strong, comfortable and hard-wearing pendant, and it is fine to wear and enjoy in the water and in everyday life! Chain is not included with your pendant. 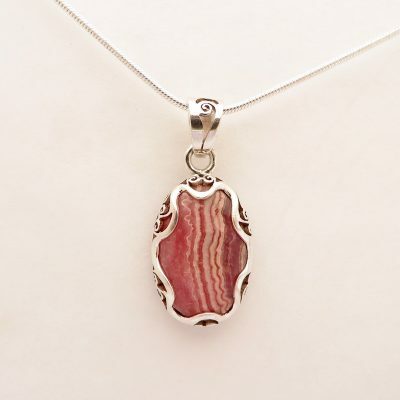 With the purchase of a pendant, you are eligible to a 30% discount off our chains. Use the coupon code 30chain to activate. Click here to view our range of chains.